The wheel on my passenger side sticks out further than the driver side. Trying to see how to fix this. Body/frame has been aligned. New control arms, coilovers. Not uncommon on older cars especially with bigger wheels & sitting lower to see this body misalignment. My passenger side is still a hint tighter after listening mounts & shifting over. If the body and frame are straight, have you tried switching the wheels side to side to see if the problem is still present or does it change sides? Maybe by some wierd chance you have 1 wheel with a different offset or possibly a different width??? I don't know just throwing out ideas. Are all 4 wheels and tires the same size? 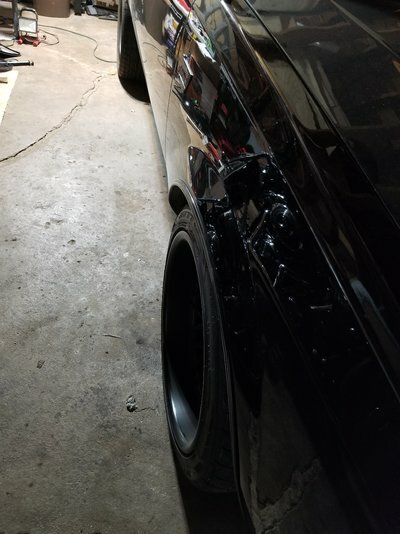 If you have a staggered setup with wider wheels and tires in the rear maybe a rear wheel and a front wheel got mixed up at the tire shop. Thanks. Yeah, that's what I have heard. Was hoping someone has tried to fix this. Bugging the hell out of me. Thanks. Yes, swapped front wheels and confirmed wheels are ok. It's that driver side. Same result after swapping wheels. 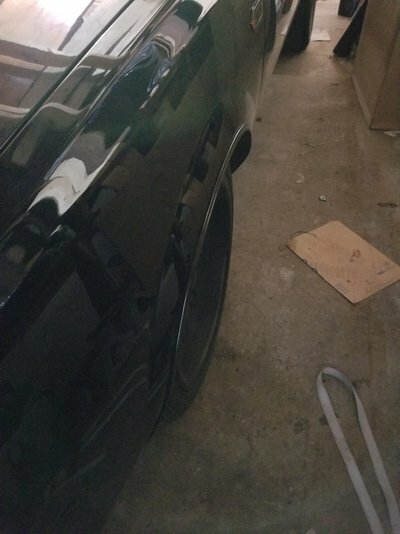 Offset/width between front and rear is very different. I'm sure wheels are not mixed. Thanks for suggestions. Possibly 2 different thickness rotors. What Haley just said backs up what I said. On my front end components last time I reinstalled, I did pry everything over at the old rubber mounts before final tightening. In one spot at the core support I was shimming it up anyways to close the upper door gap & have a bracket running through 1 support bolt that I drilled & bolted down to give a little pull in needed direction. It's also possible that the frame is suffering from middle-age spread or sag. Sometimes the upper control arm mounts move in relation to each other as the car ages/goes flying over speed bumps/etc. The crossmember is not as stout as you might think, and like I said, it isn't unusual to see some change over time. It's more common in unitized construction (think Fox Mustang, and all those tower braces), but does happen in frame cars as well. Driver or passenger side control arm?